Dipanjan Nag. Hello! I am an engineer. Nice to meet you! Dipanjan, is a developer, option trader and gamer based in Noida, India. Here he writes things, when he has no other things to do. Mostly when he is bored to hell or his Xbox isn’t able to find him a proper multi-player game and he has absolutely no intention to go out or waste time on Netflix. His topics are a bit wild, ranging from trading currency derivative to speech recognition. And sometime travelling. You may consider him as a noob gamer. If you are feeling like Overwatch, Fifa or any multi-player, throw an invite at @thereaper33927. He also likes to read scify novels and absolutely loved Red Rising Triology. What pays Dipanjan’s bills ? Dipanjan has a day job as machine learning engineer in Xavient Digital. Current responsibilities include building scalable model to discover actionable insight from real world data. As of now he is working on speech recognition, language modelling, human-machine Interaction and chatbots. Worked on Spark in conventional batch and streaming mode. Developed conventional and deep learning pipeline, with Keras, Tensorflow. Dipanjan worked with Tata Consultancy Services, as developer in data science and analytics. Mostly on Spark data processing and visualization in matplotlib or seaborn if somethang fancy was needed. Either way, too much was written in 3rd person and frankly that’s lame and painful to read. 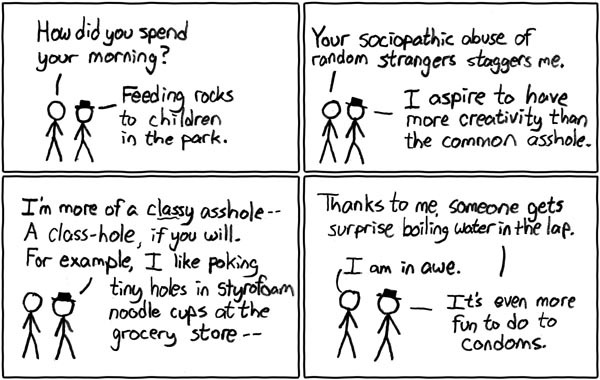 So here is a random xkcd to lighten the tone. There was a plugin for that, but somehow it wasn’t gernrating random comic everytime I visited. So I tried to change the plugin code a bit and everything went dark with a 500 error. Now I can not use the wordpress editor to edit plugin anymore. So I had to ssh to my server and fix the thing. It seems like I forgot that many language including php use ; as statement terminator and I am not writing python. So much trouble. This is horrible!